The Sculptors’ Group consists of professional and amateur sculptors working in a variety of media. The Group serves as a forum for sculptors to exchange ideas and technical information about 3-dimensional art. All AAG members are welcome to participate if you are interested in sculpture; whether it is your primary art interest or not. The Sculptors’ Group has been meeting for 22 years and is a vital adjunct of AAG. We meet on the first Monday of the month from September through November and January through May. We hold many of our meetings in the AAG Building but from time to time, we enjoy visiting artist’s studios in and around the valley. Please check the agenda below often for a schedule of dates, times and locations of meetings, since they will be changing as our agenda evolves. For more details about the AAG Sculptors’ Group, contact Douglas Hebert at doctorwooo@cox.net. Join Eliza for a demonstation of her work followed by a tour of the Grant Street Studios, home of the Arizona State University Grad Students. State of the Art equipment in large open spaces promote creativity and originality of work produced by the next generation of emerging artists. It is always fun and exciting to see what our talented youth are doing. If you have never been there, be sure to seize this opportunity! Originally from Great Falls, Eliza Weber received a BFA from The University of Montana. She has completed a short residency at Medalta in Alberta, Canada and a two-year Artist in Residence at Pottery Northwest in Seattle, Washington. Afterwards, Eliza spent two years at Kansas State University as an Instructor of Record. Her work has been shown in national and international exhibitions, and can be found in galleries throughout the west. She is currently pursuing her MFA at Arizona State University. Vincent Gonzalez was born and raised in Chandler Arizona. He is a Costumer (Cosplayer) building props, costumes, etc. out of foam, paint, and other materials. As you can see in the image posted here, his work is detailed and precise. This will prove to be an interesting and informative evening discussing the combination of materials and ideas. 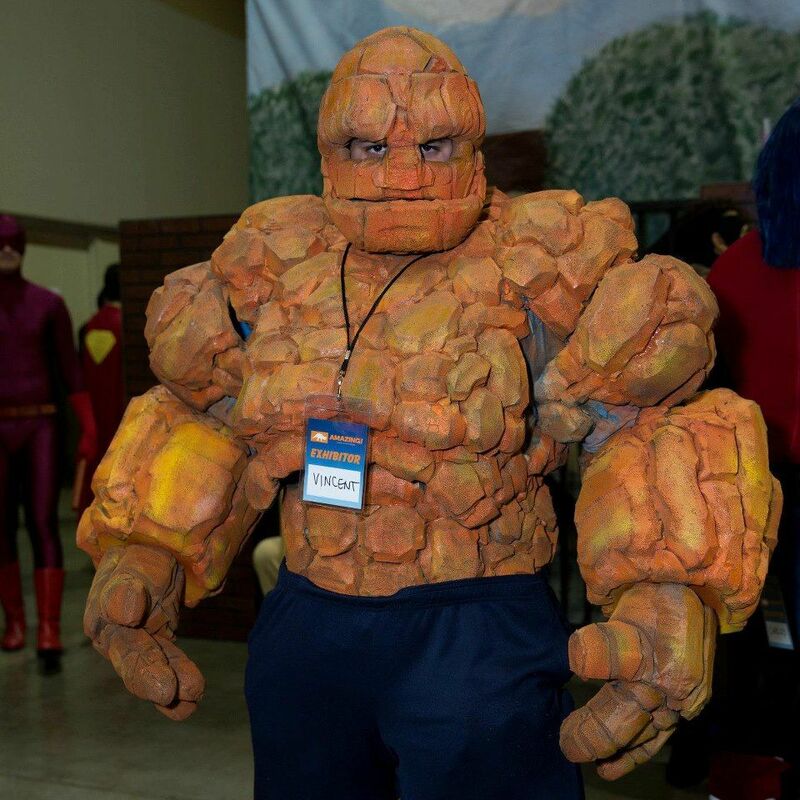 In addition to Costuming, Gonzales is passionate about watching and studying the fine art of moviemaking, specifically movies within the superhero genre. It helps to inspire his art. He continues to learn and try new ways to create. Through his YouTube channel he makes video reviews, demonstrates how he modifies a simple mask into a character, and talks about his process and journey in life. Sarah’s training in art began when she was about 10 years old. Her babysitter was a professional artist and taught her many painting techniques. This interest was supported att home where her mother taught her fiber arts such as sewing and crochet. She graduated Cochise Community College with a AA in 2005. An opportunity to work as a teaching assistant diverted her education. In 2009 she obtained a cosmetology license. 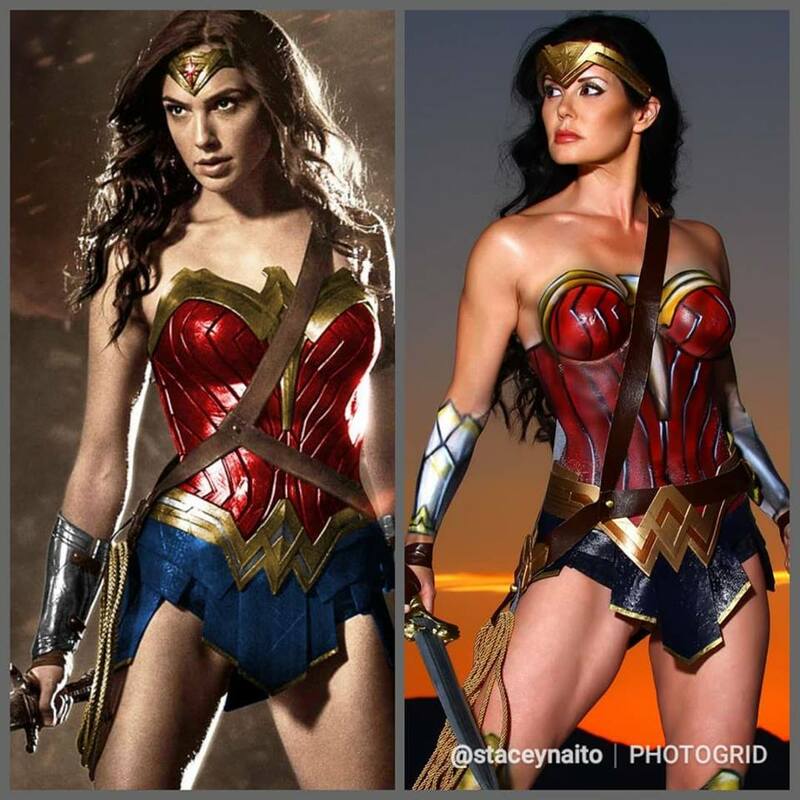 It was not until 2012 when asked by a friend for help sewing a costume for a local Comic Con that she began delving into the world of Cosplay. Since then she has experimented with a number of art mediums. She currently works as a cosplay seamstress for Idiotengine while continuing to wrok as a teaching assistant. She combines her sewing with painting, and occasionally she gets the opportunity to do sculpt on props. A friend to AAG, Saskia Jorda was one of the three judges for 2018 Statewide Exhibition. 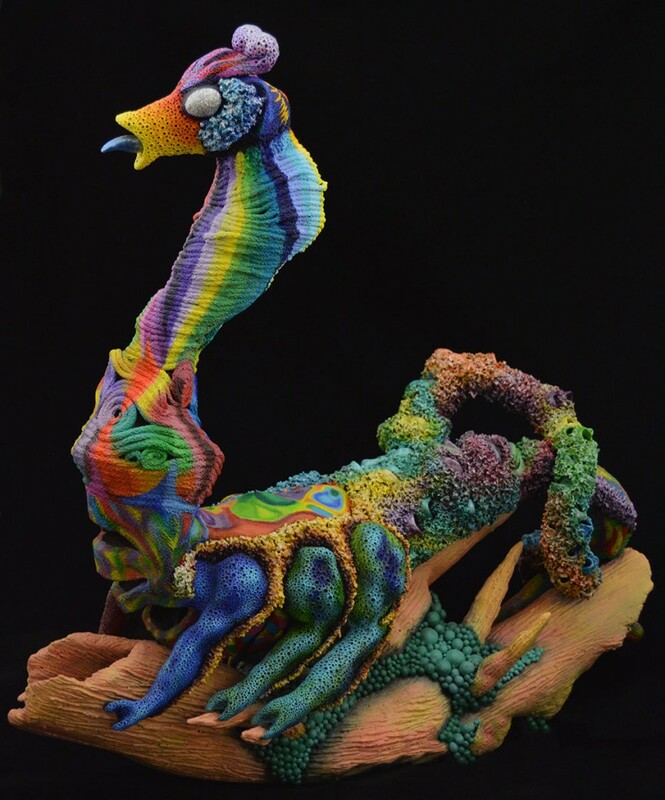 An accomplished artist, Jorda works primarity with fibers, from sewing, felting and sculpting. This award winning artist brings her unique vision to AAG in this talk and demonstration of her work. Saskia Jorda was born in Caracas, Venezuela and works with site-specific installations, drawings, and performances that map the tension between retaining one’s identity and assimilating a foreign persona. She received her BFA in Painting from Arizona State University in 2000, her MFA from the School of Visual Arts, New York, NY, in 2004 and studied at the Skowhegan School of Painting and Sculpture in 2005. Jorda has exhibited at Grand Central Art Center in Santa Ana, CA, Modified Arts Gallery in Phoenix, AZ, Richard Hayler in Dallas, TX, Step Gallery, Arizona State University in Tempe, AZ, and Historic Hotel San Carlos in Phoenix, AZ. She has also participated in many group exhibitions locally and internationally. These international venues include Haidian Theater in Beijing, China, Museo de Arte Moderno y Centro Cultural de España in Santo Domingo, Dominican Republic, Festival Internacional de Arte Contemporaneo in Leon, Mexico, Art Basel and Volta in Basel, Switzerland, and Kunst in Het Geuzenhuis in Ghent, Belgium. In 2015 she was awarded the Arlene and Morton Scult Contemporary Forum Artist Award, Contemporary Forum from the Phoenix Art Museum. Previously she has been the recipient of several other awards and honors. Jorda currently lives and works in Arizona. Papi Miranda is a professional airbrush artist, prop maker, cosplay artist and body painter. He has been airbrushing for 14 years. Eight years ago, he discovered a new surface to work on and brings his skill to the often overlooked and incredibly detailed work of bodypainting. His inspiration stems from either comic books, anime, video games or movies. Miranda is an expert at creating epic works of art with the human figure as his canvas. His works are incredible. This is sure to be an exciting evening. Harold Baldwin is longtime member of Arizona Artists Guild. 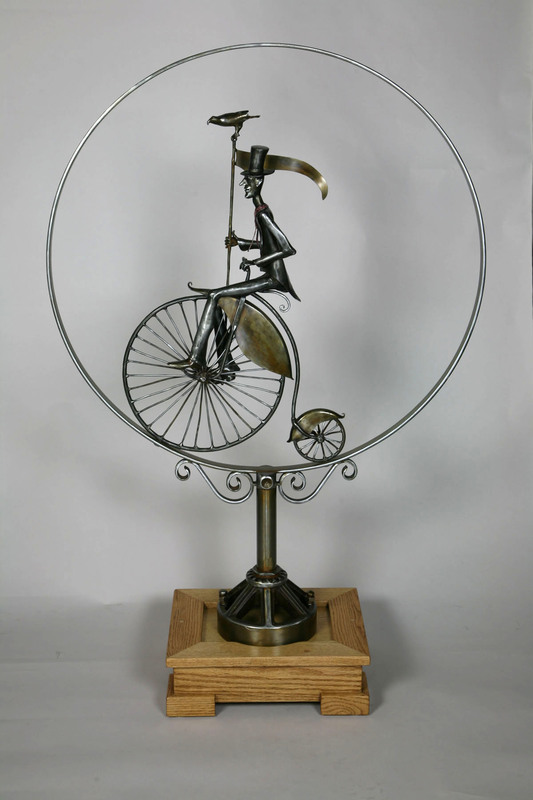 Highly respected for his creativity, skill and the precision with which he creates his work, which is often kinetic. A retired industrial arts teacher from the Phoenix Union High School District he continues mastering machine-shop processes and creating unique metal works. Although born in Kansas, Baldwin could not be more Arizona home-grown. He moved with his family to Wickenburg as a toddler and then onto Phoenix. He attended now-defunct Phoenix West High and Phoenix College’s art program before graduating from Arizona State University. Along the way, Baldwin realized he could “draw with metal.” The epiphany was a life-changer. In the early 1970s, Baldwin built his home, mostly by himself, in the desert near South Mountain. The beautiful house includes a painting studio for Joyce, his wife of 51 years. Baldwin built his own workshop/studio as a standalone building behind his residence, and it serves as the hothouse for his myriad creative impulses. Following Baldwin’s presentation, there will be a sculpture group critique. If you are planning to attend, you are invited to bring a sculpture with you. 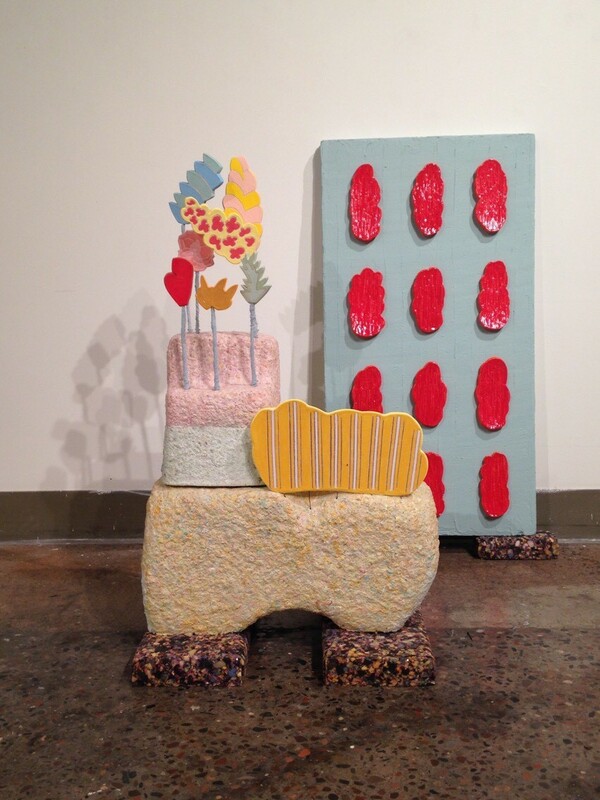 Christine Cassano is an interdisciplinary artist with a focus on sculpture and installation-based works. Her artwork explores the intrigue, unease and fragility between humanness, technology and ecology. She exhibits her work locally, nationally and internationally including recent exhibits at the Phoenix Art Museum and a solo exhibition at Mesa Contemporary Arts Museum. Cassano is a grant recipient of the 2018 Artist Research Grant from the Arizona Commission on the Arts funded in part by the National Endowment for the Arts. 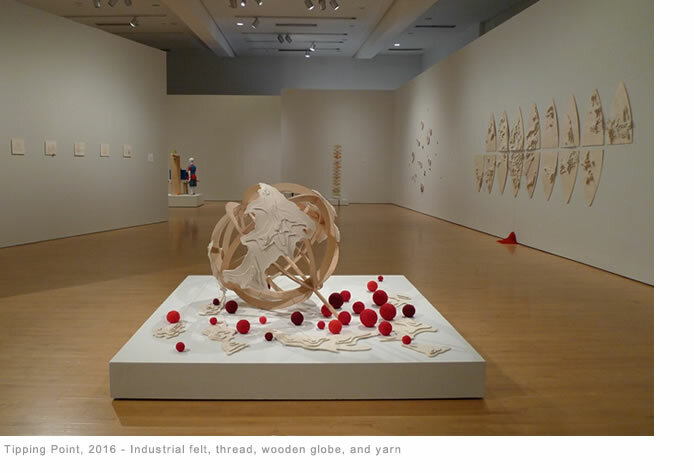 In 2016, she was awarded the Contemporary Forum Artist Grant from the Phoenix Art Museum, supported in part by the Nathan Cummings Foundation Endowment and in 2015 was a grant recipient of Phoenix Institute of Contemporary Art resulting in a published artist catalog of her work. Cassano has been featured in numerous publications including having her work featured on the cover of nationally published books. With artwork in various collections throughout the US, her installations and public art works have also been commissioned by a number of architectural firms, developers, universities and hospitals. In Arizona she is represented by Gebert Contemporary Gallery in Scottsdale. My recent work combines a complex array of form and texture with a very controlled, frequently complicated , hand-painted acrylic finish. In contrast to the end product, however, the idea behind each sculpture is really very simple. 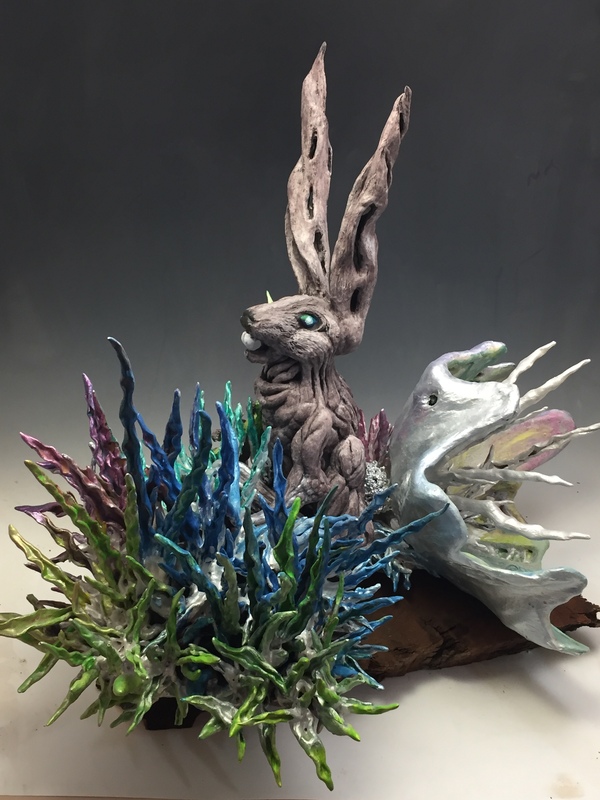 All of my pieces begin with the concept of one existing animal mounted on a base the resembles topography found in nature such as trees, log, or coral. The terrain is generally quite textured (but not always) and practically never mirrors the animal’s natural habitat. When creating the creature itself, I make a boundless attempt to augment and distort its structure and surface until it is virtually unrecognizable from the beast it once was. I take the very same drastic approach when selecting the final color application and finish. Doug grew up in Berkley, Michigan- a Detroit suburb where the economy and jobs were driven by the auto industry. In Berkley, a career in the arts raised eyebrows. 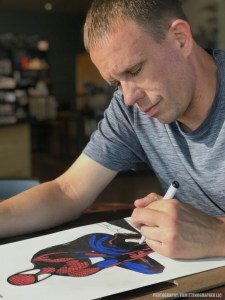 Still, Doug and his dream were well supported by loving family and friends and he successfully completed his BFA in drawing from Siena Heights University in 1999 and graduate work at Wayne State University. He received his teaching certificate at Wayne State in 2006 and moved to Phoenix, Arizona where he teaches art at Amberlea Elementary and adult hand building and sculpture at Desert Dragon Pottery Art school in Phoenix.